Can the V01 valves be used in conjunction with other accessories? Yes, when an instrument assembly consists of multiple components such as valves, siphons, dampeners or any other accessories it is important to consider the available connections on each component to determine if the assembly can be configured properly. Can the V01 valves be supplied with other seat options? Can the V01 valves be supplied with a higher maximum allowable working pressure? No, see V02 series for higher maximum allowable working pressure options. Do the V02 valves include pipe plugs or vent plugs? All plugs are purchased separately. Are the V01 valves available with a material traceability report to EN102042004 3.1 on the pressure boundary components? Can the V02 valves be supplied with a higher maximum allowable working pressure? Can the V02 valves be used in conjunction with other accessories? Are the V02 valves available with a material traceability report to EN102042004 3.1 on the pressure boundary components? Can the V02 valves be supplied with other seat options? Are the high pressure ball valves available in other materials? Yes, contact our world headquarters at (203) 378 8281 for more information. When should a siphon be used? Siphons should be used in applications when instruments need to be protected from direct exposure to live steam. What is the purpose of dampening devices, and what are the types? A dampening device is used when a pressure instrument may be exposed to repetitive pressure fluctuations that are fairly rapid, high in magnitude and especially when transitory pressure spikes are present that exceed the instrument range. Throttle screws and plugs - provide dampening at an economical cost. They have the benefit of fitting completely within the gauge socket and are available in three types 1. A threaded type which permits easy removal for cleaning and replacement: 2. A Pressed in, non-threaded design and 3. A Pressed in, threaded design which provides a highly restrictive, helical flow path. Not all styles are available on all pressure instrument types. Pulsation Dampener/Ashcroft® model 1106 - threads onto an instrument socket and provides restriction by means of moving a pin, which may be placed in either of five different sized holes and thus allows the user to vary the amount of dampening to suit requirements. The pulsating pressure moves the pin up and down, providing a self cleaning action. Pressure snubber/Ashcroft® model 1112 - used for dampening and filtering, the snubber has a metal disc available in four standard grades of porosity 1. D: for use with oil, 2. E: for use with water and light oils, 3. G: for use with air, steam, and gases, 4. HX: for use with mercury. Due to the large filter area, the snubber has fewer tendencies to clog than orifice type devices. Needle Valves/Ashcroft® models 7001/7004 - an adjustable throttling device for severe applications. It provides the most practical means for varying the orifice to determine the exact orifice for any specific service condition. Pressure Limiting Valve - protects pressure instruments against surges and pulsations. Provides automatic positive pressure protection and accurate repeatable performance. Automatic pressure shut-off. Built in snubber enhances instrument, protecting performance. Are the V02 valves available in materials other than 316SS? Yes.Contact Ashcroft inside sales or contact our world headquarters at (203) 378 8281. Are the low pressure ball valves available with male connections? No, the low pressure ball valve is only available with female connections. Are the low pressure ball valves available in other materials? No, the low pressure ball valve is only available in 316SS. Can the high pressure ball valves isolate in either direction? Yes, the low pressure ball valves are bi-directional (as opposed to unidirectional) and can be installed with either port being the inlet or outlet. Are the high pressure ball valves available in other connection sizes? Can the low pressure ball valves isolate in either direction? Are the low pressure ball valves available in other connection sizes? Ashcroft provides a standard certificate of conformance with each packing list, we also offer a signed certificate of conformance with added statements when requested by you, the customer. To order a signed certificate of conformance - please be sure you include the CD1A option with your part number. What is a Certified Calibration Certificate? A certified calibration certificate provides the user with a serial numbered instrument along with a calibration certificate that it has been calibrated/certified in accordance to the pressure instrument standards with instruments that are traceable to NIST. A certified calibration chart made per: ASME B40.100 2013 Pressure gauges & attachments. ASME B40.200 2008 Thermometers with masters traceable to NIST To order a certified calibration certificate - please make sure you have the XC4 option in your part number. Does Ashcroft recommend using a dampening device with a diaphragm seal? Can a diaphragm seal be used on Ashcroft's® model 1490? No. Ashcroft's® model 1490 is for gas applications and cannot be attached to diaphragm seals. When is a diaphragm seal used? A diaphragm seal is an isolation device that is attached to the inlet connection of a pressure instrument to isolate its measuring element from the process media. A diaphragm seal is commonly used in a variety of process applications where corrosives, slurries or viscous fluids may be encountered. The diaphragm seal affords protection to the instrument where: The process fluid being measured may clog the pressure element. Pressure element materials capable of withstanding corrosive effects of certain fluids are not available. The process fluid may freeze due to changes in ambient temperature and cause damage to the element. What Ashcroft® instruments are not available with diaphragm seals? What type of diaphragm seal fill fluids does Ashcroft offer for high temperatures? What fill fluid must be used on diaphragm seals to be used on chlorine applications? Can you use Teflon® diaphragm material with Bromine, Chlorine, and Fluorine? What are the flange rating conversions to PSI ratings? How do I reset my password on my digital gauge? Depends on the software version, it is 1-2-0-4-5 or 1-2-*-4-5. I want my digital gauge to read in another engineering unit other than PSI. Can I do that? Yes you can. For all digital gauges, pre-programmed units can be accessed through the MENU function. The Model DG25 (only) can also read customer-defined units. What is the difference between a loop powered digital industrial gauge model 2174, and a line powered digital industrial gauge model 2274? The 2174 is powered by the 4-20mA signal, while the 2274 is powered using a separate power supply. If the model 2274 includes the optional 4-20mA output or switch(s) the output signal and switches will have separate contacts from the power supply. The unit has most likely been exposed to over or under pressures. As they are is not field resettable, they will need to be returned to Ashcroft for evaluation and possible recalibration. My Model DG25 digits are flashing. Is it broken? No. The unit is likely in "tare mode". A short press of the tare button will return the unit to standard measurement mode and read the current pressure. How do I wire my current or voltage output Digital Gauge? Please reference the Installation and Maintenance guide for your model. On my digital gauge can I rescale my 4-20mA output for these units? By re-scaling the graph, the 4-20mA can also be re-scaled. Accuracy of the gauge is based on full scale range. Re-scaling the graph does not change the full scale range. Instructions to alter the graph are in the Installation and Maintenance manual - see page 12. Do you sell digital gauge field replacement parts? No. The units are too sensitive to encourage anyone other than Ashcroft production to fix. In addition, they may require calibration as part of the repair. Do Ashcroft digital gauges come with a calibration certificate? Calibration certificate are standard on the model 2089. All other models require the XC4 option at the time of order. Can I order non-standard ranges for digital gauges? Depends on the product family. Precision: no. Industrial: maybe. DG25: Yes. If range isn't already set up, there will be a set-up fee for a new range. What is the gauge storage and shelf life for Ashcroft® gauges? Does Ashcroft offer Receiver and False Reading gauges? Does Ashcroft recommend user repair/reconditioning gauges? Does Ashcroft have gauges suitable for ammonia applications? Do Ashcroft® products comply with the Pressure Equipment Directive? How do I order PLUS!™ Performance? The product variation "XLL" designates PLUS!™ Performance in all Duragauge®, 1279, 1377, 1379, 2462, and Duralife®, 1009, 1008S type pressure gauges. How do I identify the material of my Bourdon tube and socket? Can PLUS!™ Performance be used in paint applications or other applications where no silicone is indicated? The standard PLUS!™ Performance cannot be used in silicone free applications. However PLUS!™ Performance is available in a silicone free version. Order as XNZ for no silicone. Does the throttle plug do all the work with a PLUS!™Performance gauge? No. Throttle plugs are designed to only fight pressure pulsation. Vibration requires either a liquid filled gauge or a PLUS!™ Performance gauge. Does Ashcroft offer any pressure gauges that can be used to measure pressure underwater? Can Ashcroft attach a diaphragm seal to models 1187, 1188, and 1189 low pressure bellows gauges? Are Ashcroft Duragauge® movements repairable/replaceable? What are the available cleaning options for Ashcroft® type 1032 Sanitary Pressure gauge? 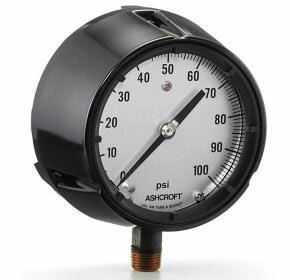 Can Ashcroft's® 2.5/3.5" 1009 and 63/100mm 1008S gauges be liquid filled in the field? Does Ashcroft have NACE compliant instruments? What if my application sees severe pressure fluctuation or pulsation? Pressure pulsation can be dampened by several mechanisms; our patented PLUS!™ Performance gauge will handle the vast majority of applications. One exception to this is high frequency pulsation which is difficult to detect. The only indication may be an upscale zero shift due to movement wear. These applications should be addressed with a liquid filled gauge, or in extreme cases, a remotely mounted liquid filled gauge connected with a line of capillary. The small diameter of the capillary provides excellent dampening, but can get plugged. Pulsation dampeners and snubbers are alternative auxiliary devises which dampen pulsation with fewer tendencies to plug. Also throttle plugs or throttle screws inserted in the pressure connection of the pressure gauge may help solve this problem. This is quite subjective and depends upon the severity of the indicated pressure. The environmental limitations for the pressure gauge series should be observed in all cases. Gauges used in situations outside these requirements may result in inaccuracies, premature wear and/or failure of the gauge and would require additional maintenance. The frequency of calibration therefore, is best left to the user to determine. How do you select the pressure range of a gauge? The range of the instrument should be approximately twice the maximum operating pressure. Too low a range may result in low life due to fatigue of the elastic element due to high operating stress and susceptibility to overpressure set due to pressure transients that exceed the normal operating pressure. Too high a range may yield insufficient resolution for the application. Can PLUS!™ Performance gauges be oxygen cleaned? Yes. You must specify the silicone free option XNZ along with the XLL PLUS!™ Performance option. Our process cleans the system to meet ASME B40.100 Level IV. What if I have a unique pressure connection? Do you offer a spare parts list? Ashcroft does not offer a spare parts list; it is recommended that the user stock one complete Ashcroft instrument for every 10 of that instrument type in service. I'm looking for a pressure gauge, but all I know is the dial size, range, and connection size. How can I find the gauge I need? What types of accuracy does Ashcroft offer for pressure gauges? Does PLUS!™ Performance affect accuracy? No. The only difference is that the response time is similar to liquid filled gauges. What is the difference between the proof pressure and burst pressure? Frequently asked questions on Ashcroft® temperature switches. Are Ashcroft pressure and temperature switches intrinsically safe? Can a diaphragm seal be used on a switch? Does Ashcroft offer a sanitary pressure switch option? Does Ashcroft offer a UL Listed Steam Limit Control Switch? Does Ashcroft offer a UL Listed and FM approved medium pressure Gas and Oil Limit Control Switch? The setpoint is the pressure, temperature, or differential pressure value where the electrical switch makes or breaks contact. The unit will return to the original or normal position once the switch reset point has been achieved. What does static pressure mean? Static pressure is the pressure exerted by a fluid or gas that is not moving or flowing. For differential pressure applications the static pressure refers to the lower of the two pressures applied to the actuator. What does explosion proof mean? A term commonly used in the industry referring to enclosures capable of withstanding an internal explosion of a specified gas without igniting surrounding gases. Strict installation practices in accordance with the national electrical code are also required for safety. Ashcroft currently offers many different types of explosion proof approvals such as UL, FM, CSA, ATEX, and IECEx. Can Ashcroft® switches be cleaned for Gaseous Oxygen Service? What is the accuracy or repeatability of a pressure switch? Accuracy normally refers to conformity of an indicated value to an accepted standard value. Since there is no indication in switch products, the term repeatability is used as the key performance measure. Repeatability is the closeness of agreement among a number of consecutive measurements of the output setpoint for the same value of the input under the same operating conditions, approaching from the same direction for full range traverses. Using this definition, the accuracy and repeatability of an Ashcroft® pressure switch is typically +/- 1% of full range. What is the difference between proof and burst pressure? Proof pressure is the maximum pressure which can be applied to a pressure switch without causing damage. While burst pressure is the maximum pressure that can be applied to a switch without causing leakage or rupture. A switch that has been subject to proof pressure should still be operational, but may require a recalibration of the setpoint. However, a switch that has been subject to the pressures near or at the burst pressure can be permanently damaged. What is deadband (Hysteresis) in regards to a pressure switch? Deadband is the difference between the setpoint and reset point of a switch. Deadband can also be referred to as the hysteresis of a switch. Where within the operating pressure range can I set the setpoint of my pressure switch? Ashcroft recommends that the setpoint be within 15 -100% of full range for an increasing setpoint and within 10-95% of full range for a decreasing setpoint. What is the longest capillary length available on an Ashcroft® temperature switch with remote mounting? The longest capillary length is 100 feet. Please consult the factory for special requirements. Does Ashcroft offer a pressure switch with a DPDT switch? No, but in the A, B, F, G, L, and P series you can get a unit that has 2 SPDT switches that actuate at the same setpoint to simulate a DPDT switch. SPDT - Form C contact - single pole double throw, one contact which flips over, switching the input from Normally Closed to Normally Open. DPDT - 2 Form C contacts - double pole double throw, the same but two ganged together. Are CRN #'s available for Bimetal Thermometers? No, because thermometers are not pressure bearing instruments. The CRN #'s are available for Thermowells. Do Ashcroft® Bimetal Thermometers contain mercury? Can safety glass be used on a liquid filled Bimetal Thermometer? No. We only recommend polycarbonate windows with a liquid-filled thermometer due to case design. If this is not acceptable consider the 600B (dry) with the XSG option. A Thermowell performs an invaluable triple-duty service: 1.) it protects delicate instrument sensing elements against corrosive effects and physical damage caused by media flow, 2.) it permits the instrument interchange or calibration check without disturbing or closing down the process and 3.) it helps to contain costly or dangerous process fluids when properly installed as an integral part of the vessel or piping. What cable lengths are available for the electric contacts? Can custom line lengths be obtained on remote mounted thermometers? Yes, provided they are ordered in whole feet measures. What is the IP rating for a Duratemp® Thermometer? IP54 for all Duratemp® Thermometerexcept the 600H model which is IP65. What is the difference between NPSM and NPT instrument connection threads? NPSM threads are actually parallel but have the same pitch as NPT/NPF providing a fully engaged nice fit. NPT to NPT threads both being tapered can leave exposed threads. What is a lag on a thermowell? A lag is the added EXTRA length on the installation end of a thermowell, typically called out to account for insulation thickness. What types of electrical terminations does Ashcroft offer for their transducer products? Is the XRH option available on the 0.25% accuracy CXLdp? The XRH option in not required on the 0.25% accuracy CXLdp. The 9 point NIST traceable calibration report ships with all 0.25% F.S. accuracy CXLdp transmitters. Can the GC30/31 be ordered with a NIST Calibration Cert? Yes. A nine point NIST traceable Calibration Chart is available for the GC30 and GC31 by requesting the XRH option. Does Ashcroft offer a freeze-proof remedy for Ashcroft® pressure transducers? The GC30/31 pressure sensors are 3-in-1 products (Digital pressure gauge, pressure transducer, pressure switch). Does the customer have to use all three in order for the product to operate? No. The only requirements for the GC30/31 to operate is a power supply and connection to the pressure being measured. The unit can operate simply as a digital pressure gauge if that's the only need. How does the user adjust the pressure switch settings, analog output scaling, range, etc of the GC30/31? The front of the GC30/31 products has a keypad for the user to configure settings. The Instruction manual contains all of the necessary details needed to program the unit. Can I buy connectors and cable harnesses for my transducers? For most model pressure transducers, Ashcroft offers mating connectors and cable harnesses. Please contact the factory with the model/part number of your transducer so we advise a connector/harness part # and an Ashcroft dealer to purchase from. Do the GC30 or GC31 products replace any current Ashcroft® products? No. The GC30 and the GC31 are unique new products that add to our current product and application capabilities. Can Ashcroft non-standard calibrate in the vacuum scale? No. The K1 and A2 transducers are only available with full vacuum scale (and/or positive pressure). In those compound situations, the positive pressure range can still be non-standard. I need a transducer with a non-standard (positive pressure) calibration. Is that something Ashcroft can do? Yes, Ashcroft can. Non-standard calibrations are available for low pressure differentials, A2 and K product lines. These ranges should be verified by the product specialists. The Installation and Maintenance manual says that I need to hook up two or three wires but my transducer came with four wires? Ashcroft manufacturing has standardized on 4 conductor cables, so one or two wires may not be used. Please install per the instructions in the Installation and Maintenance manual, using on the appropriate wires. The transducer is labeled as Ashcroft, but I cannot locate the model number printed on the label on either the Ashcroft website or through an internet search? The model transducer you are searching might have been discontinued and replaced by a new model, or it could be a custom model number normally sold to OEM's and not listed on the Ashcroft website. Please contact Ashcroft with the model number, information printed on the label and a picture of the unit if possible. How frequently should an Ashcroft® transducer be recalibrated? Ashcroft® does not recommend a specific recalibration cycle for our transducers. Recalibration standards should be established by our customers for their specific application. Can the display be rotated on the GC51 for mounting the gauge on its side or upside down? Yes, the display of the GC51 can be rotated to accommodate the horizontal or vertical mounting positions. My transducer is hooked up and not providing any signal. What do I do? 1. Confirm the wiring is correct, Installation and Maintenance manuals are helpful here. 2. Confirm the power source is good and appropriately sized. Units require the necessary power at the transducer, not at the source. 3. Check with an external meter for expected output. If all issues are checked and the problem cannot be resolved, we ask that you contact an Ashcroft product specialist. Do you offer anything that could read/display the pressure of the transducer? Yes! The DM61 is an Ashcroft® panel meter that can read voltage or amperage units and translate the signal to any customer defined units. How do I determine which model Ashcroft® transducer to purchase with so many models to choose from? The model transducer needed is normally determined by the specifications required which include: pressure range, output, process connection, electrical connection, media compatibility, and accuracy. Other factors include specific agency approvals such as CE, Intrinsically Safe or Hazardous Duty. Ingress Protection ratings and quantity of transducers can also help identify which Ashcroft® model to select. Can my transducer be recalibrated? Only transducers that have accessible zero and span potentiometers can be recalibrated.